The truck camper we decided on is a Northstar Igloo 9.5. We looked at campers for over a year. We went to the big camping show in Hershey, PA. We did on-line research. We narrowed things down to units that would fit on our single rear wheel Ford F350 diesel. That isn’t as simple as it sounds. The truck has a GVWR of 11,500 pounds and weighs around 8,600 pounds without the camper. That means you only have about 3,000 pounds of carrying capacity for the camper and your passengers. You would be amazed how many campers weigh 4,000-5,000 pounds loaded up and ready to travel. Our Igloo weighs 2,600 pounds empty and we weighed it and the truck loaded up and on the road and with a full tank of gas, food, water, two dogs and the two of us the truck weighed 12,410 pounds. Subtract the truck weight of 8,600 pounds and you discover that the camper ready to travel actually weighs 3,810 pounds. This seems to be pretty consistent with what others say their campers weigh after they have loaded them for travel. That is, add a thousand pounds for water, propane, food, clothing and all the other “stuff” we tend to bring along. So we are about a thousand pounds over our GVWR. What does that mean? It means we have had to beef up our suspension to carry the extra weight. 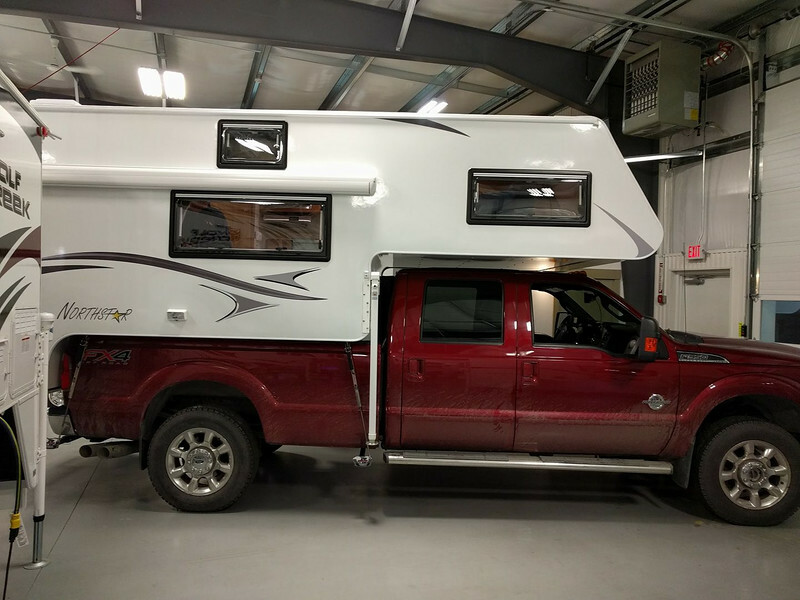 It is common knowledge that most truck campers exceed the GVWR of the trucks that carry them. The critical issue is what you do to safely carry the extra weight. However we are under our gross axle weights both front and rear, though not by much. We bought our camper at Truck Camper Warehouse in New Hampshire. Bill and Ryan helped with our selection and then helped prepare the truck for the camper. After our maiden voyage with the camper to Alabama and Florida we are confident in both the truck and the camper.